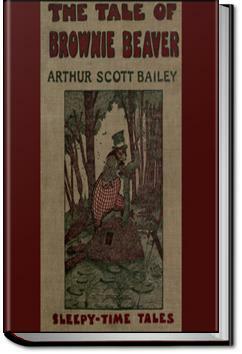 Arthur Scott Bailey was the author of more than forty children’s books, centered all his plots in the animal, bird and insect worlds, weaving natural history into the stories in a way that won educator’s approval without arousing the suspicions of his young readers. The Tale of Brownie Beaver is another adventure of the friends and neighbors of Pleasant Valley. You will hear how Brownie keeps a house safe from a Freshet and how he receives his weekly newspaper and not to forget the making of a new suit. . . .As the second day passed, the rain seemed to fall harder. And still Grandaddy Beaver kept putting new sticks on the roof of his house and plastering mud over them. And at last Brownie Beaver began to think that perhaps the old gentleman was right, after all, and that maybe everybody else was wrong. So Brownie went home and set to work. And all his neighbors at once began to smile at him. But Brownie Beaver didn't mind that. "My roof needed mending, anyhow," he said. "And if we should have a freshet. I'll be ready for it. And if we don't have one, there'll be no harm done."